Bricken Textile Building, Buchman & Kahn. Photo: Architectural Forum, June 1930, Collection of The Skyscraper Museum. NEW YORK, NY.- Once home to the largest concentration of skyscraper factories in the world and more than 100,000 manufacturing jobs, New York's historic Garment District has changed dramatically in the past 50 years, but remains one of the citys most authentic neighborhoods. 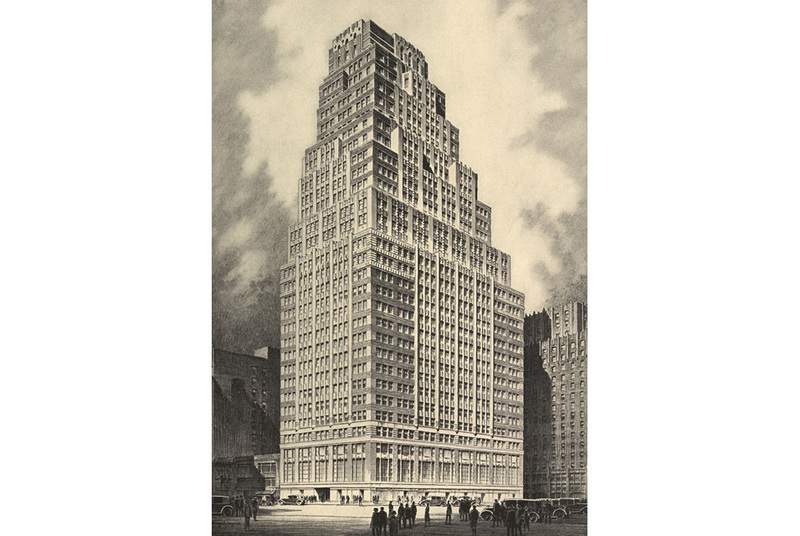 On August 5th, The Skyscraper Museum will open a free exhibition on the architecture and urban history of the Garment District  the area of west midtown from 35th to 41st Streets and Seventh to Ninth Avenues. Constructed almost entirely in the boom decade from 1921-1931, the Art Deco district contains more than 125 stepped-back "loft" buildings that took the pyramidal forms dictated by the city's then-new zoning law. For three months, through October 31st, The Skyscraper Museum is reprising in a pop-up space at 1411 Broadway at 40th St., the URBAN FABRIC exhibition it originated last year in its lower Manhattan gallery. In more than 150 historic photographs, architectural drawings, advertisements, and films, the installation documents the distinctive built environment of the district, as well as evokes the teeming streets, crowds congregating at lunch hour, trucks clogging the thoroughfares, and myriad delivery carts that once populated the busy streets directly outside the exhibitions doors. The installation design by Cooper Joseph Studio has as its centerpiece two large patternmaker tables that hold massing models of all the loft buildings that frame 37th Street from Seventh to Eighth Avenues. Giant diagonals of colored fabric cut across the upper ranges of the high-ceilinged space. Guest curator for the exhibition is Andrew S. Dolkart, the James Marston Fitch Professor of Historic Preservation at Columbia University's Graduate School of Architecture of Architecture, Planning and Preservation. This show summarizes his years of research on the architects and developers who created the district. He traces the story of the Eastern European Jewish immigrant builders whose careers typify the American rags-to-riches story. Raised in poverty in the tenements, they struggled to make a living in sweatshop factories, opened their own garment businesses, then became real estate developers. They hired architects of similar backgrounds who created a spectacular group of loft and showroom buildings designed with stone bases, brick upper stories, cascading setbacks, and distinctive rooflines that created bold canyon-like streetscapes, while meeting the developers requirements of maximum rentable floor space. The exhibition will be open free of charge from August 5th, 2013October 31st, 2013 at 1411 Broadway at 40th St., Monday-Friday from 12-6pm.